Some people have dogs that bark while playing agility. I’m not talking about the dogs that are crated on the side of the ring (that’s a different topic! ), but the ones that bark while they are running a course in the ring. Frustration since they aren’t clear on where they are supposed to go or what their handler wants them to do. Frustration of having to stop and “fix” something – for example a missed weave pole entry. The presence of the ring crew, the judge or some other trigger that might be present. Just for the pure joy and excitement of running the course! Dogs that bark out of frustration from unclear and/or untimely cues can be helped by their handler. Most of the time this type of frustration is marked by a dog that is running nicely, but then suddenly turns and barks at the handler. Reviewing video tapes can help since trends may show up. Does it only happen with discriminations? Is the dog clearly being shown where to go with body language? Are the cues early enough for the dog to be clear on where to go? (This is mostly seen with very fast dogs.) Is the dog being allowed to run ahead as fast as he wants or being held back by the handler running relatively slow? 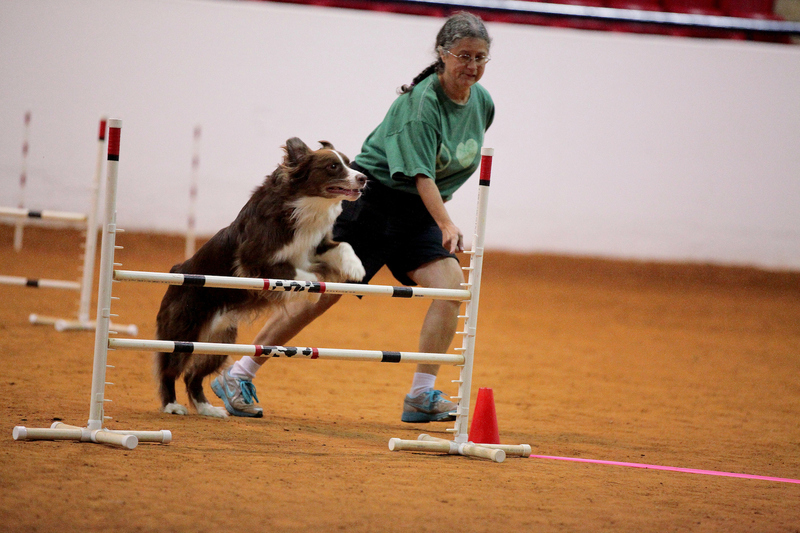 In agility we usually have many things happening simultaneously as we run a dog around a course – motion, position of different body parts, verbal cues, etc. The handler should decide exactly what the cue for an obstacle or handling maneuver is for the dog and the dog should be trained to respond correctly to it. It could be the movement of certain body parts in unison, or motion in a certain direction while moving body parts in a particular way, or just a plain verbal cue. To determine if the dog truly understands the cue, the handler should set up the situation that is causing the frustration for the dog and omit everything they might be doing except the exact cue that is supposed to be letting the dog know what he should do. For example with a discrimination, if the dog is supposed to know to take the tunnel instead of the dogwalk due to a verbal cue such as ‘tunnel”, the handler should place the dog in a sit-stay in front of the discrimination, release them, and say the word “tunnel” and see if the dog takes the tunnel. The handler can then continue to proof the dog by repeating this test and standing or running in different locations and see if it makes any difference. The handler could even take it so far as to use body language to indicate the dogwalk while saying “tunnel” and if the dog really understands the verbal “tunnel” cue, the dog should take the tunnel every time. Likewise, if the cue is some combination of body language, then the handler should omit all of the body language that isn’t considered part of the cue and test the dog’s understanding in a similar manner. Something else to consider is if each cue the handler gives around the course is different enough from other cues. In the discrimination example, is the cue for “take the tunnel” different enough from the “take the dogwalk” cue? Is it very obvious and clear to the dog or are you just running at the discrimination and hoping for the best? The handler may need to make some changes to how the dog is cued in these types of situations. 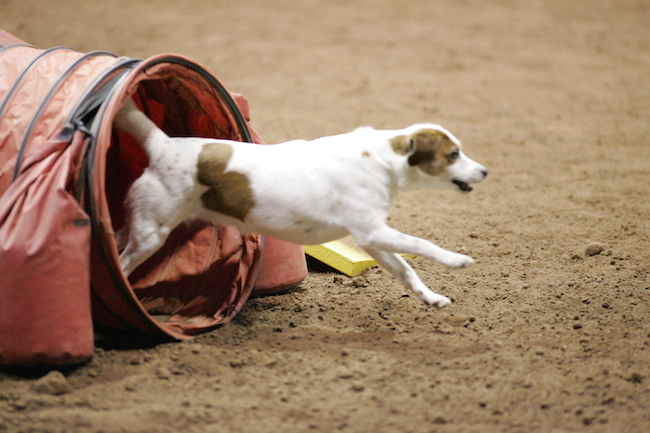 The timing of the cue should be early enough that the dog has time to set himself up for the most efficient path and to perform the obstacle correctly. Some dogs get frustrated at being “jerked around” at the last minute while running a course. First we’re going one way and then then other. Dogs that are experiencing this will sometimes bark in frustration and have very jerky paths around the course. This increases the time it takes to run the course since the dog’s path doesn’t flow well and is very hard on the dog’s body. In the case of a discrimination, the timing of the cue should be early enough that the dog can adjust his path to take the correct obstacle. Dogs that are barking while running with slower handlers may need to be “set free”. What I mean by this is that the handler should start using more distance so that the dog can have fun running as fast as he can – in a controlled manner of course! Using distance and cuing early enough can help a lot in this situation. There are many places around a course in all venues where the dog can be sent to drive ahead and then met again at another place in the course. Layering is another option. For some driven dogs this can be the difference in agility being a fun or a frustrating experience. Of course all the distance work needs to be taught and planned out while walking the course. Barking due to frustration from having to start an obstacle over can also be fixed by helping the dog to understand how to perform the obstacle correctly and giving timely cues for that obstacle. A common place this happens with is the weave poles. The dog misses the entrance and is brought back to start over again. Fast, driven dogs may become frustrated with this since they love to push forward as fast as they can and now have to stop and go back. The key here is to test the dogs understanding of how to perform the weave poles. Can the dog find the correct entrance and collect himself appropriately from any angle? From any obstacle? Coming from an obstacle that requires some collection is very different from coming out of a straight tunnel at full speed. Is the weave pole cue given early enough so he can start collecting and make the correct entry while approaching with the most efficient line possible? Is the weave pole performance independent of the handler once the cue is given or is the dog relying on the handler to show him the entry? 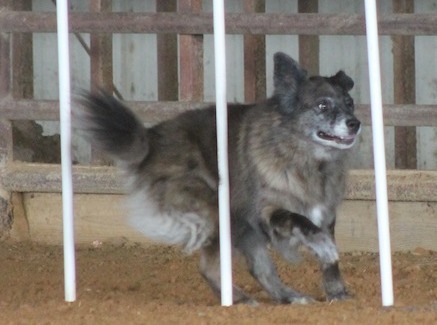 Will the dog complete all 12 weave poles while the handler runs away laterally or in the opposite direction after the dog is committed to performing them? Barking from this type of situation goes back to proofing and the understanding of how to perform the obstacles. Some dogs may bark at ring crew, judges, or other things that may make them nervous or fearful. I know some people that have successfully worked with dogs that were scared of men at one point in their life for example. In most cases, this goes back to working with the dog outside the trial environment to help them handle the things that trigger them to bark out of fear. There are many options now to help these dogs including Controlled Unleashed games, BAT, etc. It may require the help of a behaviorist depending on how bad it is. The dog should not be taken in the ring until it is determined that the dog can safely handle the environment and circumstances it’s being placed in. Finally, some dogs just bark through the entire run just for the joy of it! Because they love the game and are so excited! Personally I have no problem with this type of barking. The dog is in a happy place and having fun with their handler and that’s what this game is all about! Trying to make the dog stop barking can make the game less fun or even stressful for them so I say let them bark! Most of the time, the barking was trained along with the behaviors required to perform the obstacles or the handling, so that it’s just become part of the game. If the handler really doesn’t want this kind of barking, then it should not be rewarded from the very start of training. Otherwise, it’s just part of the fun of running agility as a team! ← Cowtown Dog Sports Welcomes VALOR!